The four Robin’s Eggs from The Nest Of Blue did not survive. The mommy Robin disappeared one day and never came back. Her fate unknown. The eggs never had a chance after that. I waited and checked everyday for her hoping that somehow she’d fly in from the trees and the ending would’ve been a happy one. It was not meant to be. The nest still sits under the deck with eggs, grey and dirty and I haven’t had the heart to remove and discard it. Late last week sitting on the front steps waiting for Tucker’s bus, I heard a symphony of chirping and caught the commotion out of the corner of my eye. 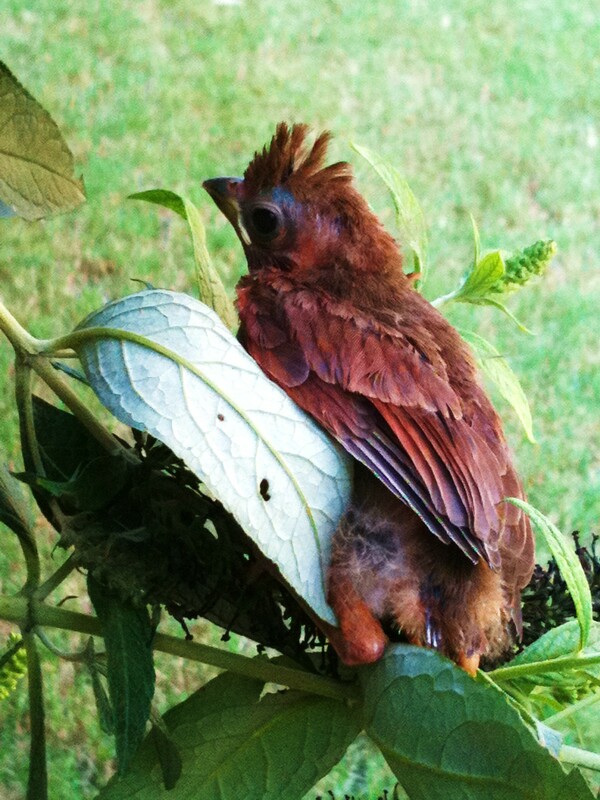 Sitting precariously in a nest toward the end of a low hanging branch, was a nest of two baby Cardinals. With mouths open wide, necks eagerly reaching up toward their mommy as she delivered another meal. 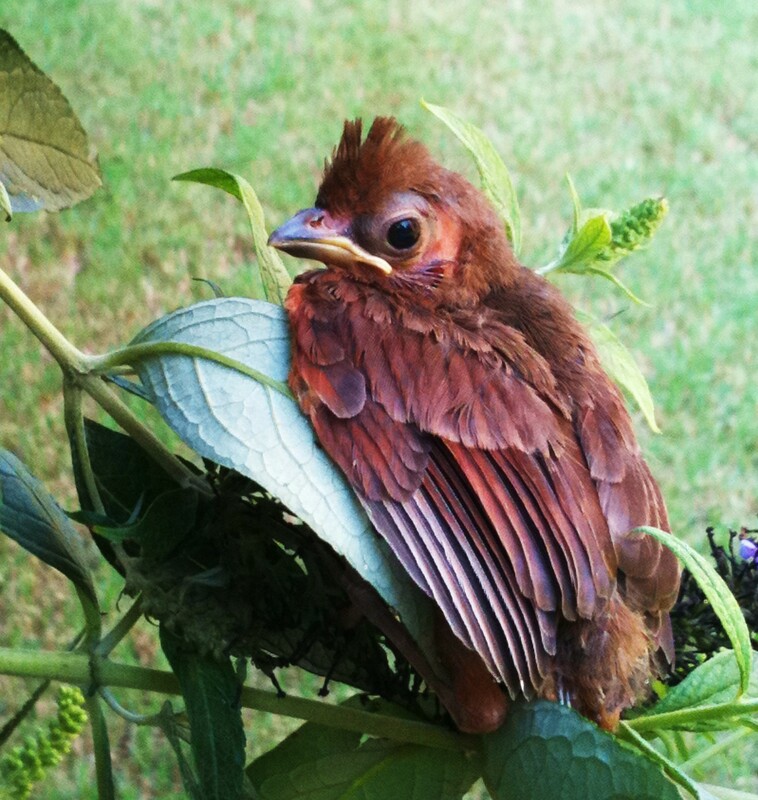 We’ve enjoyed watching the babies and the mommy each day since and yesterday the babies started to perch on the edge of the nest and flap their wings. We’ve been listening to them too and boy are they LOUD! Watch out lady, my mommy's going to dive bomb you! Leave me alone.... mommy is getting mad! Hey fellow… Please be sure to tell your mommy thank you. She’s been awfully busy flying around feeding you. Welcome to the ‘hood! We’re happy to have you. Images are from my iPhone… camera was not charged. Not too bad considering! My phobia is of birds, but I love the story! 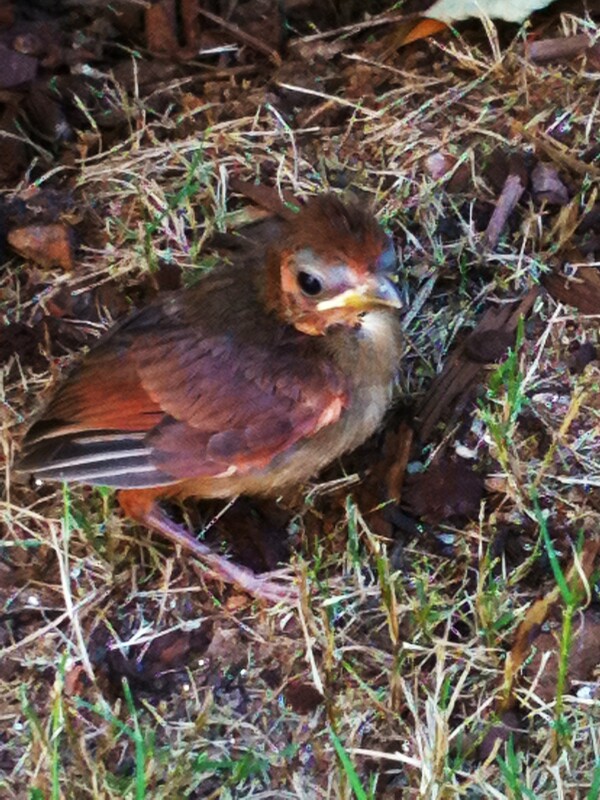 We had a nest of who-knows-whats outside our house the sring Blair was born. Paige named the mommy Ducklow and they all flew the coop shortly after Blair arrived. It was quite comforting (they were really quiet). We’ve looked for Ducklow every spring since but she must have been relocated! How adorable! I was also thinking….Bird Whisperer! I’m always talking to our outside wildlife. I use a higher pitched voice…and now all of my kiddos use that same voice when they talk to the animals! :)…And Jon just thinks we are all plain NUTS! Ha! What a great story. You got some wonderful shots too! No way! You’re the bird whisperer. Of course I was talking to it like an insane woman, but he/she was so cute! I can’t believe I actually found them. They are so loud! Now if I could become the brain tumor whisperer, I’d be in business!